I visited 888 (this used to be linked 888.com but 888 asked me to remove the link) today and was directed to the Swedish site and was really surprised (in a negative way). The reason for this was that most parts of the startpage are in Swedish but a few items are in English. I do not see any specific reason for this because when you actually select the categories in English you come to a page in Swedish. Image 1. 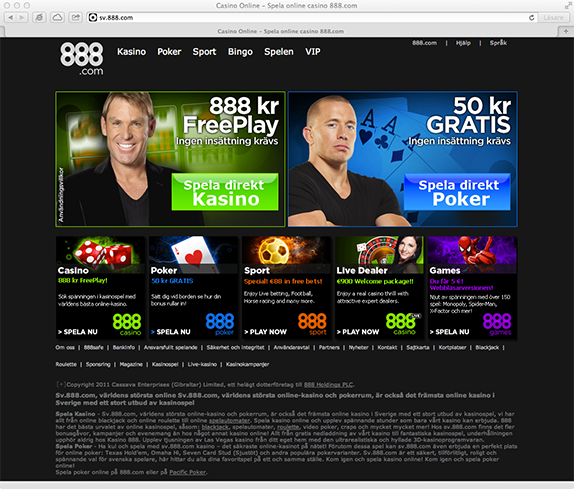 888.com’s Swedish start page. 888 (this used to be linked 888.com but 888 asked me to remove the link) is one of the biggest igaming companies out there but making “mistakes” like this do not give a professional impression. Image 2. Parts in Swedish and parts in English.